Following an objection to licence renewal on Friday 8th September 1865, Messrs. Crawshay & Youngs informed the bench that it was their intention to remove Mr. Howes on 6th January 1866. Licence granted for six months. The licence of James Skipper was renewed Tuesday 24th August 1869, but with a caution. Part of the estate of Westons (St. Georges, Norwich) Brewery sold to Youngs, Crawshay & Youngs at auction Thursday 18th August 1864. Stood next door to the ROSE & CROWN. The timber & plaster frontage was bricked over during the time owned by Youngs, Crawshay & Youngs. Tuesday 7th February 1905 - Licence renewal referred to session to be held 7th March 1905 on the grounds that the house was redundant and unnecessary. 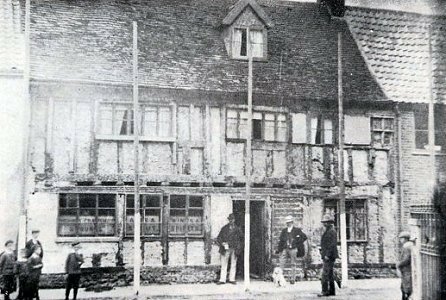 See page 19 of ` Wymondham in Past Times '.